Over the past two decades, a widening gulf has emerged between illness presentation and the adequacy of traditional biomedical explanations. Currently, the UK is experiencing an "epidemic of common health problems" among people in receipt of State incapacity benefits and those who consult their general practitioners. Most do not demonstrate a recognisable pathological or organic basis which would account for the subjective complaints they report. As a result, thecauses of many illnesses remain a mystery for both patient and physician, with the result that increasing numbers of people are opting for alternative or complementary medicines. To bridge this gap between illness and its explanation, without abandoning the clear benefits of the biomedical approach,many healthcare professionals have begun to consider a biopsychosocial approach. Central to this approach is the belief that illness is not just the result of discrete pathological processes but involves and can be meaningfully explained in terms of personal, psychological and socio-cultural factors. In particular, the beliefs held by patients about their health are considered central to the way they behave and respond to treatment. However, such beliefs are not specific to patients only - they can greatly influence the behaviour and reasoning of health professionals as well. Psychosocial influences such as beliefs are also relevant when considering society's views regarding the aetiology of illness, recovery and potential for treatment. At a time when public trust in doctors and science isundoubtedly diminishing, a better understanding of patients' beliefs is clearly a priority for clinical practice and research. 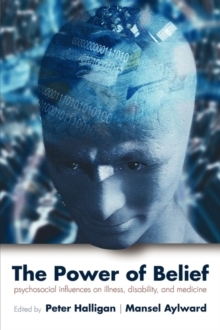 The Power of Belief brings together a range of experts from neuroscience, rehabilitation and disability medicine and provides a unique account of the role and influence that belief plays in illness manifestation, medical training, promising biopsychosocial interventions and society at large.